Looking for a boho wedding dress with flutter sleeves? Bridal designer Stella York has created "the one" for you! Lace and tulle over matte-side Lustre satin is the perfect combination of fabrics for this lovely gown. Cotton-style lace makes up a sheer bodice that is embellished with water pearl details. 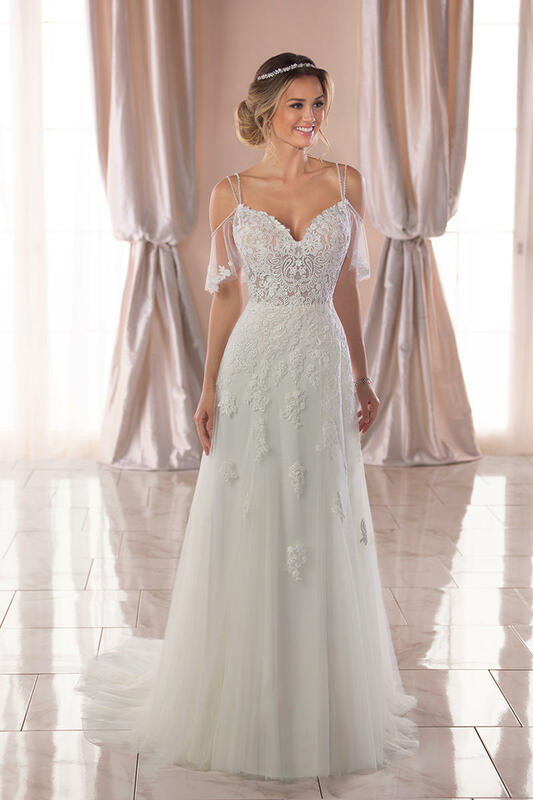 The lace takes on a floral pattern which helps to highlight the luminous beading throughout the bodice. Soft and romantic sheer off-the-shoulder flutter sleeves add a touch of boho elegance all brides will love. An open back features two beaded back straps and a short, sheer train.